I think it’s great that people want to learn how to contact their spirit guides on their own rather than be attached to seeking validation through psychics and mediums on a regular basis. 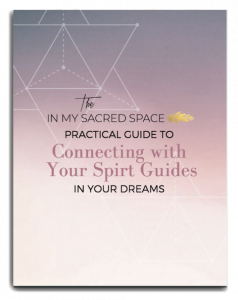 There’s a lot that goes into contacting your spirit guides so I want to make sure I cover it thoroughly, and that’s why I’ve decided to break this up into as many posts as necessary to cover the topic. 1) Stop thinking of it as “connecting” and realize that you are already connected. You were never not connected. There is no divide to cross, no chasm, no bridge. Your spirit guides are as much a part of you as you are of them, so there’s no need to “connect” to your guides, only broaden your awareness of YOURSELF enough to be able to see and feel that connection. Why do you think you have to hear it? Why couldn’t you feel or know or receive communication from your spirit guides through some sort of synchronicity? More than likely, this person completely missed the answer to their question because they were only looking in one place rather than just being open to whatever may come. Don’t expect to get results immediately. The best thing I can tell you is to ask for a sign from your guides, and then don’t think about it anymore. Don’t worry about it, don’t overanalyze every little thing and don’t go looking for it. Just sit back and wait for it to come to you. In the meantime, watch some tv or something. Who knows, your sign might come to you in the middle of an episode of The Big Bang Theory? Signs are often of the most subtle yet personal nature and they can come when you least expect, you only need to learn to recognize them. 3) Be open. A lot of people try to contact their spirit guides this with the attitude of wanting the other side to prove itself to them. They need that proof, that one mind-bending experience to convince themselves that this all for real. That’s the irony of that kind of situation – the very fact that they are begging for proof denotes that they most likely won’t get it. Their belief is already set on the side of doubt, thus blocking them from being able to have such an experience. That said, it’s exceptionally important to remain neutral to the situation. Too far on the side of doubt and you’ll be second guessing every little thing and too far on the side of belief and you’ll think the fact that you toilet won’t flush is a spirit playing a prank on you when in fact, you just used too much toilet paper. Being open means that you see things and you hold them as possibilities, rather than immediately attaching to them as truth or immediately rejecting them. When you just hold it as a possibility, you’re able to say, “Alright. Let’s just see where this goes.” and there’s no cognitive dissonance associated if it doesn’t pan out, and you don’t run the risk of being gullible. Just roll with it! Keep reading parts two and three for more information on how to contact your spirit guides. Spiritual guides do speak to you. During meditation is where I got to know my spiritual guides. They would show me visions of things in my karmic past, or give me clues that I would look up on my computer that would help me translate the meaning of what I was being told. I have a “spirit” room where I have figurines of Africans and Native Americans. Their spirits would sometimes appear in my meditations. I asked their names, and when they told me I would look the name up, and every time, the name would correlate with something about the figurine. For example, one of the figurines is an African woman with a lily in her hair. She told me her name, and when I looked it up, it meant the same as “lily.” Once they know that YOU KNOW you are connected, and that your purpose is a sincere wish to learn how to love yourself, others, and all things in a better more humane way, they speak to you, they comfort you, and they show you things when they know you’re ready to receive them. Another thing is that I never really wanted anything from them other than to make my relationship with them a conscious thing. You have to be honest with yourself, and with them, and your purpose, whatever it is, must be an unselfish one. I also had these experiences with the figures on the first 9 or 10 Tarot Cards just by lying down at about an hour before daybreak and letting myself relax fully, but not sleep. I would hold the card in my hand and wait for the entity to appear in whatever vision appeared in my mind. This somehow created, within me, a deep listening mode, and when they would come they would begin to speak, and I listened. I learned how to distinguish my own mental voice from theirs; it was just a feeling I got that the words were not coming from some preconceived notion I had; I would know that because what was being said were things I had NEVER thought of before, ways of being that were not a part of my experience. After the session was over, I’d get up immediately and tape record everything I remembered because I knew I’d forget if I didn’t. It was one of the most astonishing things that ever happened to me. I didn’t complete all the Tarot figures. I think it was because I had gathered all I had the capacity to process at that time. Both experiences, however, with the spirit guide meditation, and the Tarot, helped to shape two very transformative periods in my life, and helped me to expand my meditations so that I began to get in touch with the 4 elements in a small, but very satisfying manner. I work out chapters in my book using meditation, and also work out chapters in the development of the love which I, and all of us, are the products of.